My name is Aaliyah Stancil, I’m Orion Jennison Henderson, my name is Kobe White, and I am Haylee Collins. We are all members of Dover Youth to Youth and we are here downtown today – along with students from Rochester, Epping, Somersworth, Milton, and Newmarket – to make the community aware of e-cigarettes and the way they are advertised. We are concerned about the rising popularity of e-cigarettes. We feel this is a problem because people (especially teenagers and youth) have been turning to e-cigarettes because people think they aren’t addictive and they’re less harmful than regular cigarettes. E-cigarettes seem healthy or safe because of the way they are advertised and portrayed. We are concerned about the unknown chemicals and the fact that people might not just start using e-cigarettes, but will also turn to traditional tobacco. This demonstration will hopefully make our community more aware of the problem that e-cigarette and big tobacco companies are creating. To get this message out, we are holding this event downtown and protesting with big visuals, posters, and palm cards. We will also be chanting and explaining our concerns to pedestrians and answering any questions that pedestrians have. Over the next year, Youth to Youth will be continuing to make PSA’s, videos, and giving presentations to educate people about e-cigs and their consequences. By taking all these actions we hope to spread our message about how the companies that are making these e-cigarettes are often the same companies that make traditional tobacco products. We don’t want our peers to be tricked by big tobacco again and become addicted. We feel that advertising for e-cigarettes make the product look harmless. Big tobacco companies try and advertise the same way they have done in the past with regular cigarettes to make it look like you won’t become addicted. And, an overdose of nicotine can cause nicotine poisoning which can cause you to become very sick. But e-cigarettes are advertised with positive images and candy flavorings that target youth. There are thousands of different flavors available from many companies. Examples of flavors include banana, vanilla cupcake, and pomegranate. “It’s upsetting that this generation is turning to e-cigarettes. They think it’s harmless because e-cigs are advertised with candy flavors,” said Aaliyah Stancil, a 6th grader at Dover Middle School. 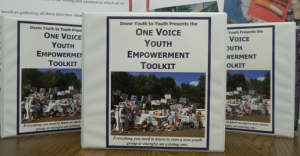 This campaign is being kicked off during Youth to Youth’s week long Summer Training Program that teaches students from Dover, and surrounding communities, the knowledge and the skills they need to take action to take on the drug problem. Over 70 experienced and new students from programs in Dover, Rochester, Milton, Newmarket, Somersworth, and Epping are participating in the training program this week.